Could this boost the U.S. economy? The world is t-Minus two days away from the probable unveiling of Apple's iPhone 5 , and even though we've seen the leaks and know it will be a hot commodity, the new iOS device's impact may reach beyond Apple's coffers. In fact, the iPhone 5 may significantly boost the U.S.'s gross domestic product (GDP), helping it grow between a quarter and half a percentage point in the fourth quarter of 2012, according to published reports. The figures come from a report by Michael Feroli, chief U.S. economist for J.P. Morgan, to J.P. Morgan clients. In the note titled, "Can one little phone impact GDP?" Feroli outlines just how Apple could grow the nation's GDP by 0.33 percent. If Apple sells 8 million units at $600 a pop in three months, he explained, the government's measure of the GDP will grow by $400 per phone ($200 would go towards import costs). That comes out to $3.2 billion during the last part of the year, or an annual rate of $12.8 billion. Though these estimates are "fairly large," Feroli said they are more than plausible. The iPhone 4S was wildly successful when it launched last October and there's reason to believe the iPhone 5 launch will be even bigger. Another analyst has weighed in on just how big the iPhone 5's launch will be. Brian White of Topeka Capital said he expects Apple's stock price to soar to $1,111 - up from its record setting $680, after "the biggest upgrade in consumer electronics history." 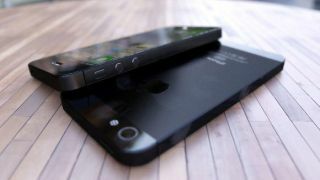 The phone should sell between 1.3 billion and 1.5 billion pre-orders in 24 hours, White said, trouncing the iPhone 4S's figure of 1 million. Between 5 million and 5.5 million iPhone 5's will be sold in the first three days it's available in stores, White also predicted, a theory that could validate AT&T and Verizon's decision to blackout employee vacation days following the rumored Sept. 21 sale date. Lastly, White said Apple will sell between 10 million and 12 million iPhone 5's this month alone. White's predictions extend beyond the iPhone 5's sales figures, too. According to him, the world will see a phone that's 15 percent thinner than the current iteration, has a "modern unibody casing" and a faster processor. Throw in a larger screen (4 inches versus 3.5 for the iPhone 4S), faster 4G LTE capability and a "better experience to showcase iOS 6" and consumers will be scrambling to pick up the new iPhone, White said. Predictions aside, we'll have to wait until Wednesday to see.